An unexpected change in wind direction today dealt a cruel blow to Puma Ocean Racing’s plans to rocket to the head of the fleet on the home strait to Sanya. 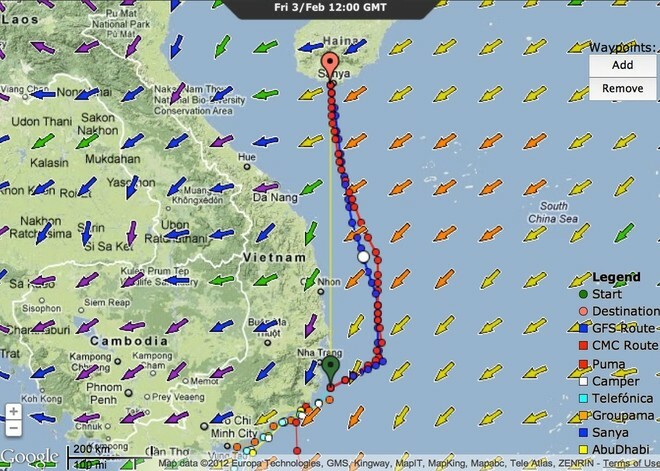 While the leg leaders shot towards the shore of Vietnam yesterday to escape strong currents that sweep south along its coastline, Puma surrendered third place in the rankings to stay offshore in the hope of better wind, calmer seas, a favourable wind shift – and an opportunity to grab their first leg win of the 2011-12 race. It was looking good for the crew of Mar Mostro until an unpredicted wind shift threw a spanner in the works, sending them back towards the coast rather than blasting them north. Two days ago the US flagged team was looking to be handily placed on race leader Telefonica, with the two boats having a similar predicted finish time in Sanya. 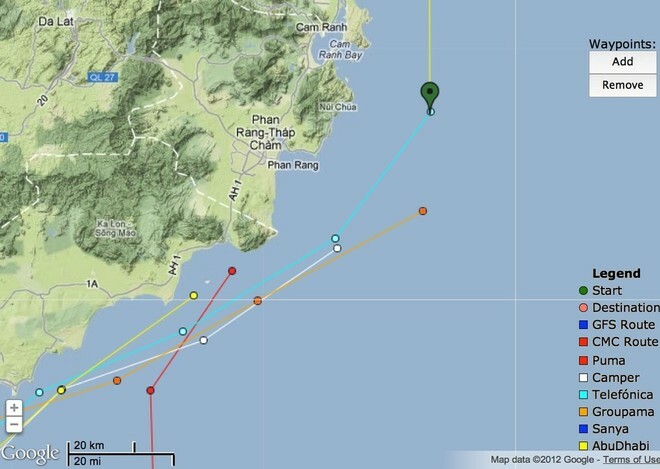 Although Puma was behind on distance to sail, she looked at that point to have a better course option for Sanya after breaking away from the fleet soon after leaving the final landmark, east of Singapore. But after the shift in the breeze, she came back into the coast earlier than planned, and lost all her advantage. She now lies in fourth place and could be fifth depending on the performance of Abu Dhabi, which is only six miles or so astern on the basis of predicted sailing distance to Sanya, rather than the distance in a direct line to the finish. The lead boat, Telefonica has about 440nm to sail and Camper is about 30 miles back, with Groupama in between. The top three positions look to be Telefonica, Groupama and Camper, on the basis of both predicted sailing distance and predicted finish time. ‘We’re not feeling very special right now,’ a despondent Ken Read told volvooceanrace.com. ‘The move east had lots of promise we got a very unexpected header, a big header taking us back towards Vietnam. Read said that, like Groupama sailing team who split from the fleet during Leg 1, they had expected other boats to follow them east. But the next position report after the team made their move showed the other teams had all plumped for the inshore option, leaving Puma on their own. Since making the move, Puma have had an agonising time trying to work out whether their strategy had paid with three-hourly position report. Rather than challenging for the lead, Read said it is likely they will have to fight Abu Dhabi Ocean Racing for fourth place in the dying days of the 3,000 nautical mile leg to Sanya. 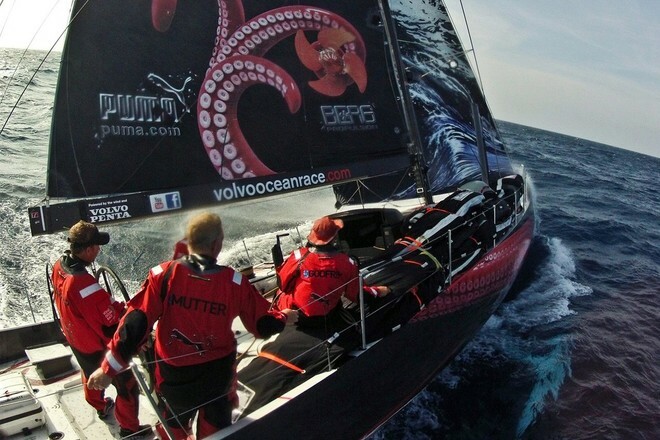 At 1900 UTC Puma were five nm ahead of Abu Dhabi, trailing Telefónica by 27 nm. Even with less than 500 miles to go to the finish line, around two days’ sailing, Read said his men would not give up and keep pushing to the end.